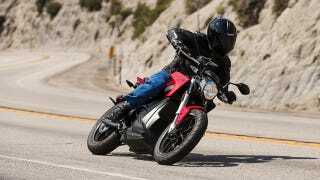 Zero Motorcycles has done more to push the electric bike game forward than any other manufacturer. While we're still waiting for Mission and BRD and Lightning to actually sell something, Zero has been chugging along, iterating and upgrading. And with its 2015 models, the features list almost lines up with the exorbitant prices. Almost. Yes, they're still prohibitively pricey, particularly when you consider what you can get for the same scratch powered by dead dino juice, but that's par for the course when it comes to EVs. The top-spec, Zero SR, with the 12.5 kWh battery, 106 lb-ft of torque, and the extra 2.8 kWh Power Tank – good for 185 city miles or 94 miles at a constant 70 mph – comes in at an eye-watering $19,840. That was a tough pill to swallow last year, particularly considering the utter lack of high-end features you'd expect on a bike knocking up against $20k. But Zero keeps adding features and has finally addressed my biggest gripes. First, every new Zero – from the torquetastic SR to the trail-friendly FX – gets Bosch ABS, which is standard in damn near everything over $10k nowadays (and often under that). Zero has also ditched the glorified mountain bike suspension for a full Showa setup, along with swapping the cut-rate Chinese rolling stock with Pirellis – Diablo Rossos on the SR, no less. New wheels on the S, SR and DS include a hollow front axle and carrier-less front rotor mount to reduce unsprung weight, while a more plush seat joins softer grips and new mirrors. It's little stuff like that that proves Zero is listening. Zero also reworked the existing lithium-ion batteries to boost capacity by 10 percent, and all in, these upgrades only tack on just $400 to the base price of the new Zeros, which will be landing in U.S. dealers in December and throughout Europe in February.